Every year we try and make a Christmas craft that doubles as a gift for the grandparents and for daddy. Last year we made the salt dough handprint ornaments. This year I stumbled across these cute ceramic ornaments at the dollarama. You’ll find whenever I post I generally talk about the Dollarama. For those from the U.S.. It’s like your Dollartree. I’m a fan! I found a pack of 4 ornaments for $2. The string and glitter I can still use for other projects so it was super cheap. And my son is only 19 months so simple is good. We painted the ornaments in 2 stages letting one color dry before adding the next to avoid mixing the colors and getting a yucky brown Hugh. 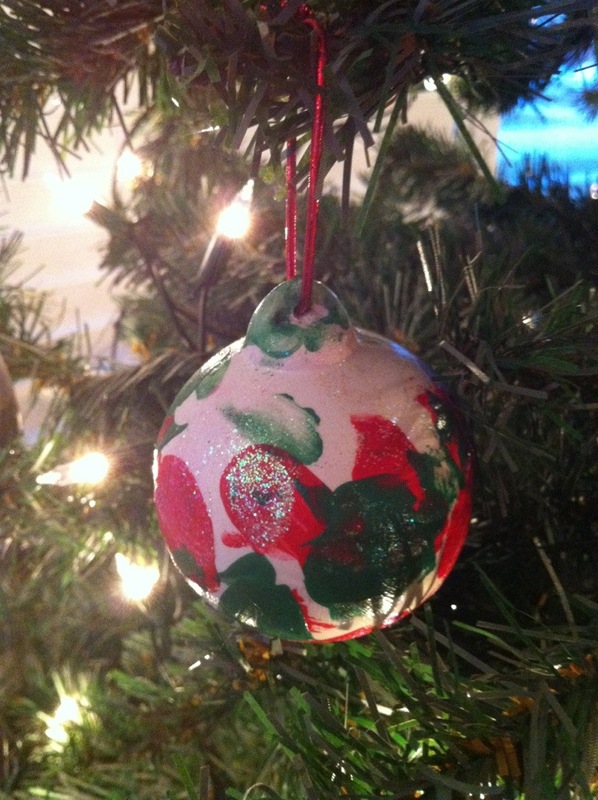 I held the ornament while he painted it as they are breakable. After all the paint was dry I added glitter. I then coated them in a layer hodge podge to seal them and make them shine. I meant to write on the bottoms the date and his name before shellacking but I forgot. Tis the Season! Happy creating!